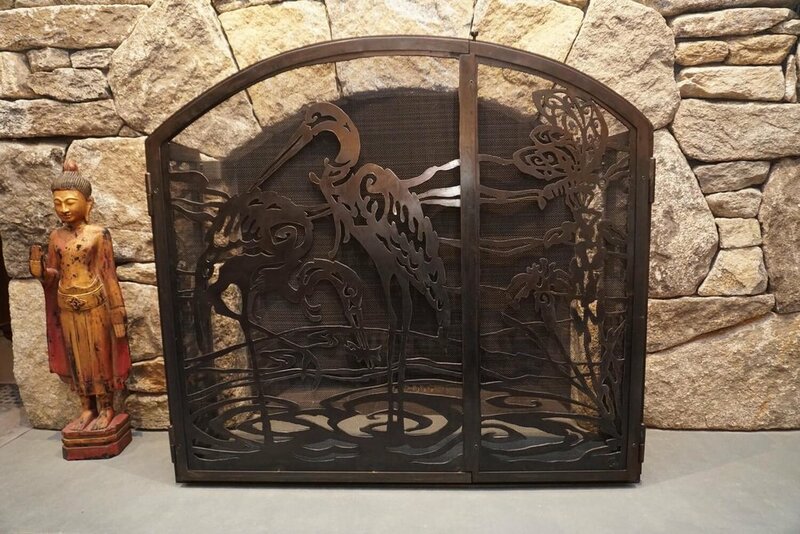 Blue herons take center stage as the featured design element for the ‘Blue Heron Bliss’ decorative fireplace screen. This fire screen design animates the impressive field stone fireplace (the work of a master stone mason) that is the focal point to the Great Room. Overlooking the gardens and Oyster Pond, the Great Room is the center of family life and entertaining. Kitchen, dining and living spaces are all part of this shared environment. Enjoying the fireplace is integral to Thanksgiving holidays and cozy evenings at home. Specifications: Steel mesh screening is incorporated into the design of this fireplace screen to ensure safety. Operable doors permit easy loading and clean out. The finish is a hand-rubbed Blackened Patina; a perfect complement to the coloration of the stone and the more refined interior of the Great Room. All design and artwork shown on this website are copyrighted materials of Studio Vlock.